As I shared my photo of Mrs. Obama and me with my friends and colleagues, no one asked me about what she had to say about the election -- or her campaign pitch. It was all about food issues and children and education. It was a brunch on July 15 held at Stone Barns, hosted by Chef Dan Barber and company, in Westchester. 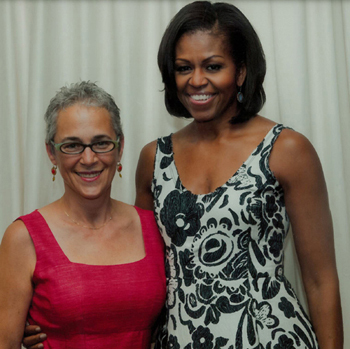 It was also my birthday, and I decided that meeting Michelle Obama would be a fun gift to myself -- and I suppose to the campaign, as it was a fundraising event. The menu was straight from the Stone Barns garden, a vegetarian's delight (with chicken for the carnivores). But all anyone I knew could talk about was "Does Michelle Obama know about your work with children and healthy eating with The Sylvia Center?" After all, our efforts pre-dated her arrival on the national scene. (The Sylvia Center was founded in 2006.) Well, it's pretty hard to get the same level of recognition as the First Lady, but I was happy to share a little bit about our activities in the brief moments we had together during the photo op. She was gracious and encouraging ("Keep up the good work"), and I congratulated her as well. Just this afternoon I listened to an NPR program featuring the First Lady and the First Kids' State Dinner she organized in August at the White House. First Lady Michelle Obama Hosts First-Ever Kids' State Dinner: On Monday, First Lady Michelle Obama hosted the first-ever Kids' "State Dinner" at the White House, welcoming 54 budding chefs to a formal luncheon in the East Room as part of her Let's Move! initiative. The guests, all between the ages of 8 and 12, represented all U.S. states, three territories and the District of Columbia. Each of the guests, along with their parents, submitted a healthy recipe as part of Epicurious' Healthy Lunchtime Challenge, which invited families to create an original lunchtime recipe that is healthy, affordable and delicious, and follows the nutritional guidelines of MyPlate. "Believe it or not, more than 1,200 kids submitted recipes for this challenge - 1,200. It's a big competition," the First Lady said. A panel of judges from the organizations that teamed up with Mrs. Obama on this initiative -- Epicurious, the Department of Education and the Department of Agriculture -- tasted each of the recipes that made it to the final round of the competition and picked their favorites from each state, as Mrs. Obama explained." Introducing children to the pleasures of delicious and healthy food has been the mission of The Sylvia Center since we welcomed our first group of kids to the farm six years ago. There are so many memorable moments, from the power of discovery and unleashed curiosity, to the wonderment of nature, to the thrill/terror of garden bugs, to the new tastes of edible flowers, fresh greens or unfamiliar veggies. Before the Obamas planted their White House garden, the Sylvia Center was firmly rooted in two acres at Katchkie Farm. Visits started with a peek in the greenhouse, which we built as we developed the program, followed by a tour of the specially-designed children's garden. Harvest, then cook -- that is the heart of the program. There has never been a kitchen -- just an open-air field house where children cook in small groups at our picnic tables. Chop, trim, shred, eat, compost. Simple steps to prepare simply delicious meals -- summer salads, soups, veggie dishes. Six years later, our programs are thriving at the farm and in the city. The past two years we have been working with NYCHA at over half a dozen locations throughout the city in six-week programs. We work with more than 2,000 children a year between Columbia County and NYC. When we started our work, a typical question was, how do we know our programs will work -- could we prove that exposing children to fresh and healthy eating would have a positive effect on their future meal choices and, in turn, their health? I always grimace at the irony of that question -- as though any of us would deliberately choose to eat unhealthy, non-fresh meals if given the choice! Enter Mrs. Obama on the national stage with her affirmation of the obvious -- that introducing children to healthy food DOES improve food choices and consequently, their health -- and things began to change. As I shared my photo of Mrs. Obama and me with my friends and colleagues, no one asked me about what she had to say about the election -- or her campaign pitch. It was all about food issues and children and education. Does she know what you are doing? Maybe she does -- The Sylvia Center would certainly benefit from her support. But more than that, it would be great to share ideas about how to reach more children, build financial support for the movement and increase awareness of the political nature of diet and diet-related disease -- that access to healthy, affordable foods is not unlike access to proper health care or a good education. This election season another lesson we can share with children is that we vote three times a day. Make every meal choice count!